Not long after graduating from college I realized that food and wine was my passion- and, more importantly, that I had to leave Virginia to find it. So in the fall of 1995 I packed up my belongings and moved to Napa Valley where I was accepted at The Culinary Institute of America. After signing up for all the wine courses they had, I eventually landed in the cellar at Swanson Vineyards. 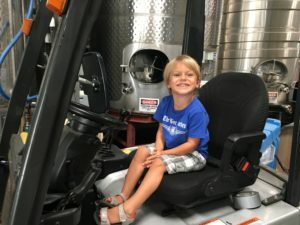 It was here amongst the grape sampling, juice pumping, barrel filling, even tank shoveling, that I fell in love with the entire winemaking process- and I wanted to learn more and more. Just as the harvest was coming to an end and I was beginning to feel at home in California, I had the opportunity to travel to the Barossa Valley, Australia for the harvest of 1996. Working at Yalumba Winery I got my first real experience ‘down under’ my hard hat crushing over 23,ooo tons. 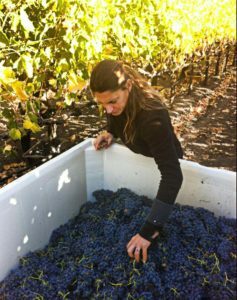 As if that wasn’t enough for one year , I decided to work the fall harvest at Chateau La Tour Blanche in Sauternes, France. They not only allowed me to work in the cellar making that delicious sweet dessert wine, but also help out in the vineyards and get a one year degree in viticulture and oenology at their school. So that brought me to the fall of 1997. Since I was still in France and had grown to LOVE those incredible Pinots I thought, “Why not Burgundy”? And so I did. A small house in Pommard called Domaine Comte Armand took me in and we made Clos des Epeneaux in the traditional ‘stomp on the cap’ way. Once that was over I came back to California and in the fall of 1998 accepted a cellar rat position at Chappellet Winery. From there, John Kongsgaard hired me at Luna Vineyards where I stayed on board long enough to work my way up to Cellar Master. It was there, in 1999, that I acquired my first batch of Sangiovese grapes and attempted winemaking on my own. The name I chose, you might have figured out, is my beloved last name (compliments of a Lebanese father). Since it is not one of those easily pronounced names, like Smith, I decided it would be best to have something else on the label to catch the eye. I decided on the lotus flower. A variety of waterlily, the lotus rises in the morning from the muddy waters to open its perfectly symmetrical petals symbolizing the creation of life; purity, resurrection and perfect beauty; the union of bliss and emptiness, night and day, male and female. The closed lotus bud signifies potential. From there I think of the closed buds popping from the bare shoots in the spring. And the beautiful process of growth and ripening that begins an dunfolds in every bottle of wine. It is my mission to work closely with the growers in order to optimize the potential the grapes already possess and allow them to express their true nature and the terroir. That leads to minimal intervention in the winery: hand-sorting, minimal to no pumping, hand punchdowns, uninoculated juice that is then left unfined and unfiltered until bottling. I am excited to say that Abiouness Wines is no longer a one woman show. In the summer of 2012 I met a Sonoma County native named John Herrguth. He has a background in Chemistry from Cal and had experience selling filtering equipment internationally before moving into the world of banking and finance. After several years managing his own portfolio as a Certified Financial Planner John began looking for a new direction to head in. 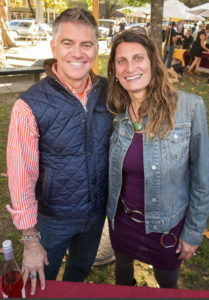 Always having loved wine and because he grew up in wine country, John thought, “Why not get into the wine business?” They say timing is everything, right?! I was looking for help running my company and John was hoping to switch careers. So we have now teamed up and we’re taking Abiouness Wines to new levels with the same focused goals. Grow amazing grapes and turn them into wine that is both affordable and delicious. Cheers!